The village of Menotomy (now Arlington) was located on Concord Road (now Massachusetts Avenue) between Boston and Lexington. With its meetinghouse and burial ground, its taverns, and its mill sites, it had encouraged settlement by dividing pastures. The Committee of Safety met in Black Horse tavern on April 18 to criticize the oppressive British policies. 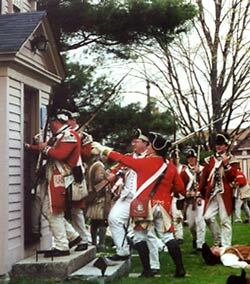 At 3 a.m., the next day the committee was awakened by the marching of the British troops through town going to Concord to destroy the military stores collected there. British troops enter the house. Returning from encounters at Lexington Green and Concord Bridge, the British troops reached the Foot of the Rocks in Menotomy around 4 p.m. on April 19. Thirteen towns had sent militia, now stationed along both sides of the road the Redcoats would take back to Boston. Lord Percy put out strong flanking parties to his main forces so the militia was now sandwiched in between. Percy gave orders to clear every dwelling to eliminate snipers. Houses along the way were ransacked, plundered, and set afire by the retreating British. The running battle continued to Jason Russell’s house. British troops bayonet colonial soldiers. With his wife and children safely out of harm’s way, Jason Russell joined men from Beverly, Danvers, Lynn, Salem, Dedham and Needham at his house, when Redcoats came from behind the house, sending the men into the house. Jason Russell, hampered by his game leg, ran to take cover too, but was shot down and bayoneted on his own doorstep. Those men who took refuge in the cellar escaped after shooting soldiers who tried to follow them down the stairs. The patriots’ grave in the Old Burying Ground. But eleven men were killed in the house and yard during the skirmish, and bullet holes still show in the cellar way, parlor, and best room. Two Redcoats were also killed here, making it the bloodiest fighting on the first day of the American Revolution, April 19,1775. The Jason Russell house and the adjoining Smith Museum of Arlington History are owned and maintained by The Arlington Historical Society. Since 1923 when the Society purchased the 1740 farmhouse the society has been an active participant in history, combining the collecting of artifacts of local history with the newer techniques of historic preservation. Photos by John Graham taken at the 2003 Patriots’ Day re-enactment of the Battle by the Menotomy Minute Men.